With all the recent hubbub surrounding the AP & Shepard Fairey's Obama image, it got me to thinking back about one of my favorite street artists. Now I know we all have certain stances on graffiti and tagging (and some of us even know the damn difference). We know of the legal kind of commissioned art and the illegal kind of thief-in-the-night vandalism. If you don't go read up. But that's not what this is about. Shepard Fairey rose to public prominence as everyone and their mom started to don the image of entertainment wrestling legend, Andre the Giant under the moniker of OBEY. That was supposedly carrying the commentary about this famous man whose life was all about being made to obey in old circus side-show freak fashion. But not many even know that. One of my faves is "Banksy". Now this isn't passing judgment on the commentary of Shepard Fairey's work. Nor is it saying that Bansky hasn't pulled some crap things in the name of so-called "art" or "cause". The whole subject just brought to mind someone that I thought did an amazing job of using the environment to tell a story using things and situations that are pre-existing. For instance below, the story is so clear and even sarcastically humorous. 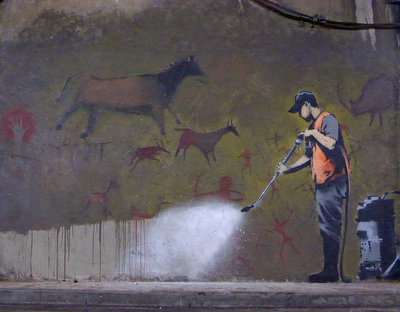 Graffiti of a power-washer removing cave drawings of the first ever form of graffiti artists. A vandal making art showing art being removed from a cave in a time where ownership was a fuzzy term and vandalism existed in different terms. Wow. To me, as an artist, that's powerful commentary. Love it or hate it, it makes you go "Hmmmm". Google "Banksy" to see more work and read more info. There is plenty of art and commentary out there about it.